Previously I have posted about our School contract and online charter, which use the principle of 3 Bees, "be responsible, be respectful, be safe" to support students understanding of why we have these guidelines. In class we unpick what each principle means to us, and work together to form our classroom learning contracts from these, discussing what they might look like in action, sometimes using digital images and captions to model these processes and routines in action, providing students with visual frames of reference and models of what we think desirable classroom behaviours and actions look like. As a staff we recently began discussing how we could develop these using the bees as characters to help students link learning behaviours to targets for curricular learning, support self and peer assessment and help develop autonomy and ownership over personal and group learning paths. I thought I'd post today this draft centrepiece for my classroom learning wall, and current thoughts around how I'd like this to work in my classroom. Its a bit tatty at the moment as it is lying on my study floor. Each child is represented in the display as a "bee." 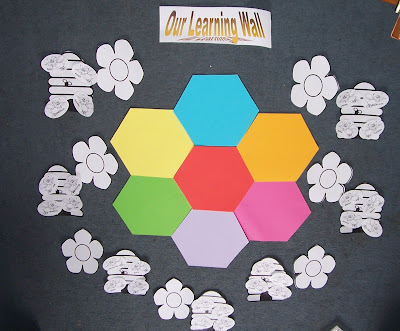 The honeycomb in the centre is where we will be displaying our learning to learn and speaking and listening targets for class and group work. These will be unpicked with the class to help identify the smaller steps that describe the learning path we need to follow towards them. Personal targets I am thinking could also be displayed here as "keys to learning," "honeypots," or individual student "flowers." This still needs some thought and discussion with the students though to enble ownership and so the display does not become too contrived. Anyway expanding the metaphor, and building on colleague sugesstions, since bees tend to work cooperatively within a hive, each hive here represents a student home team or group. I would like the students to extend work we have already begun to develop greater ownership and responsibility for reviewing and evaluating their progress together towards and within these targets, and am currently pondering how we might extend use of tools like comic life, digital imaging, audio recording and our class blog to enable and encourage this. I was struck the other day by Wordle, and how the visual representations of text had helped me see ideas differently, am considering thispart of the mix to promote talk around le arning. I am pondering how the creation of weekly or monthly text files to gather thoughts and ideas during review, might be useful in encouraging and supporting learning about learning. Asking students to use one word to sum up their groups feelings about how they worked together, their learning tasks and outcomes, or to record student descriptions of what they have learned or now understand from a particular activity could be really powerful for later discussion and as evidence of progression in the use of process skills. Student repetition would be really valuable in this case highlighting through the "cloud" commonalities in their ideas and thinking. Perhaps these could also help to support development and use of the vocabulary we need to describe features of learning and thinking together in tasks. They might also be great to display on our learning wall, visually representing aspects of our learning journey, forming starting points for discussion as we develop our grow our common language of learning. They could also be an interesting way to post to our class blog as a starting point to mediate discussions with parents and other stakeholders in our learning community about what has been going on in school. I also want to link the use of this classroom tool with how we further develop and embed learning within and beyond school through the use of online community tools. A nice tool to use with this would be Honeycomb, for obvious metaphorical reasons, but a new look at home school learning that sees these virtual places as flexible places to extend ongoing classroom projects and activities collaboratively will be an interesting place to start in developing a modelled framework for use of our VLE as we approach the huge changes due to our school in January 2009. This is only a starting point and a bit of a ramble, but I would value any thoughts or contributions you might have. I am afraid I haven't anything to contribute but I hope you can post a picture of the learning wall when it is up an running it looks like a great idea. Thanks for the encouragement John. will try to post a photo of the wall at the beginning of the project and perhaps as an occasional blogspot to share what happens as it grows. Lookybook take a look see.